My 98-year-old mother is a survivor of the Auschwitz concentration camp who was separated from her mother by Dr. Mengele. We honored my murdered grandmother by naming our daughter after her. 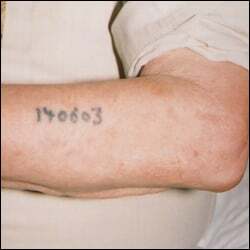 In turn, my now teenage daughter would like to honor my mother by getting a tattoo of her Auschwitz number. My daughter and I are quite divided on this issue. Can you please help? This action, the Rebbe suggested, would be the best tribute to those who perished, and the best way to express the truth that am yisroel chai, the Jewish nation is alive. In other words, symbols are nice, but it is far more effective to do something that will achieve a transformation. This is how Judaism has survived until today. After each tragedy, we manage to channel our grief into something productive and positive. This story also demonstrates that children need to get the message that Judaism is alive and well, and that it is a life of joy (not only a life of oy). Museums and memorials are incredibly important, but children should also be taught to be excited about the future of Judaism; they should feel a sense of purpose and pride as Jews. We need to show our children that they need to live the kinds of the lives that would make the six million souls proud, and that they will be the ones to pass on the torch to the next generation. Perhaps encourage your daughter to think about the following: How would a tattoo impact a positive change in the world? Certainly it would give the person who has it a sense of solidarity with those who were in the camps. However, it doesn't truly do anything positive, or do anything to elevate the souls of the six million who perished in the Holocaust. In fact, if you had asked someone who was forced to get that tattoo in the camps if they'd want a Jew 70 years later to get one as well...what do you think would be the reply? This is why it is so important to stress, even within Holocaust education, how the survivors managed to rebuild their lives, raise families and pass Judaism on to the next generation. Building Jewish institutions in the name of those who passed away, naming our children after them and raising large Jewish families are the most appropriate ways to honor the holy souls that perished. Organize trips for friends and classmates to a Holocaust museum, followed by a lecture by a survivor who turned around his or her life from tragedy to blessing. Work on creating a library of books about the Holocaust and Judaism. Interview local Holocaust survivors and their children about how they express their Judaism after the Holocaust. Create an art project expressing responses and feelings about what the Holocaust means to the third generation of Holocaust survivors. The Nazis publicly shamed Jewish-looking Jews. They denigrated rabbis, making them clean the streets. We should refrain from embarrassing anyone. And we should not be ashamed of appearing Jewish in public. The Nazis gassed and incinerated our bodies. We should be respectful of our bodies and, after death, have them buried in the ground. The Nazis did not want the continuation of Jewish tradition and would murder anyone who tried to do a religious act. We need to be proud of our traditions, and keep them alive and well. The Nazis cold-bloodedly murdered small children, doing horrific acts to their bodies. We need to perpetuate life, give love to small children and create a warm and caring environment for them. The Nazis etched into our ancestors’ bodies’ numbers and other symbols. We should respect our bodies and recognize their holiness, and refrain from damaging them or having ink etched into them. Very well put. I like the addition of a non-participating Jew at the Seder. You brought many interesting rebuttals, and I will be proud to pass this along to my daughter. Thank you for opening up my eyes and mind, and for you time, wisdom and patience. See Why Does Judaism Forbid Tattoos? and our section dedicated to the Holocaust. I remember being 8 and there was an old man with a tattoo on his left arm. My dad had tattoos and I hadn't learned about WWII yet. My mom told me not to point because it's rude. Regarding Leviticus 19:28 and its prohibition: The Torah is some 3300 years old but "tattoo" as a term only entered the Western lexicon (courtesy of the South Pacific Polynesians) in the 1800s. Among the many Anglicized versions of the Bible, "tattoo" is used some of the time (though never in publications preceding the 19th century), while the "printing" of "marks upon you" is the specific proscription to be read in others, which might or might not be the same thing. Scholars suggest the terminology in the Hebrew text is best rendered in English as an "etching" into the skin. We do know that prehistoric peoples, both west and east, marked their bodies with patterns, dots etc., often with woad dye, that is, indigo. 90 years young My. Father, my hero, celebrated his 90'th birthday this past August. Between my two sisters and myself, there are 9 grandchildren. We all converged at my parents summer cottage in Sullivan County to honor our dad. Being a first generation survivor, I did not grow up with much family. Many were murdered in WW II. Having this many family members was a sight to behold. Tears of joy streamed down his face knowing that he and my mom have raised a tight knit family that will continue to celebrate our heritage when they are gone. I too have struggled with wether I will honor my dad by putting his branding on my arm. But I've decided to have it done while he's still here to see it. To my surprise, he has no objection to it. I visited the holy land in June. I was shocked to see how many young people have tattoo's there! That helped with my decision.